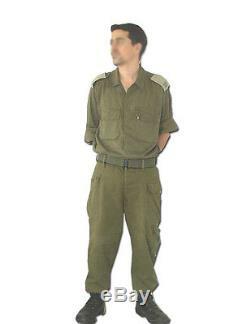 IDF, Israeli Army Military 100% Cotton Fatigue "Bet" Combat Olive Green Uniform Set. By an Official Supplier to the IDF. IDF Israeli Army Heavy Duty Olive green authentic fatigue Unisex Uniform set - Shirt & pants. 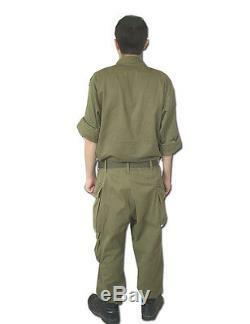 The Authentic fatigue IDF Israeli Army Heavy Duty uniforms set of the Israeli Defense Forces Unisex Uniform Shirt & pants. The IDF Israel Army 100% Cotton fatigue uniform is being used as "Bet Uniform" for labor activities inside the IDF bases as well as for training and fighting activities. Two openings for ventilation in both armpits. Double fabric on the elbows. Double layered cloth over the knee areas. In order to reduce wear and tear and to make it more durable and suitable for training there is a double-layered strengthened cloth to protect the knees and elbows area. The price includes shirt and trousers only. S / M / L / XL / XXL / 3XL / 4XL. The item "IDF, Israeli Army Military 100% Cotton Fatigue Bet Combat Olive Green Uniform" is in sale since Tuesday, October 17, 2017. This item is in the category "Collectibles\Militaria\Current Militaria (2001-Now)\Original Items\Uniforms". The seller is "samiron43" and is located in kiryat ono, default. This item can be shipped worldwide.